Mona B. Carlee Canvas Shoulder Bag | P.C. Fallon Co.
Look for the Carlee Shoulder Bag by Mona B. to turn some heads. The understated grey canvas construction features a softened hexagonal shape with zipper closure extending all across the top. On the front of the bag, there is a zippered pocket with leather trim and tab, and brown canvas trim around the top. 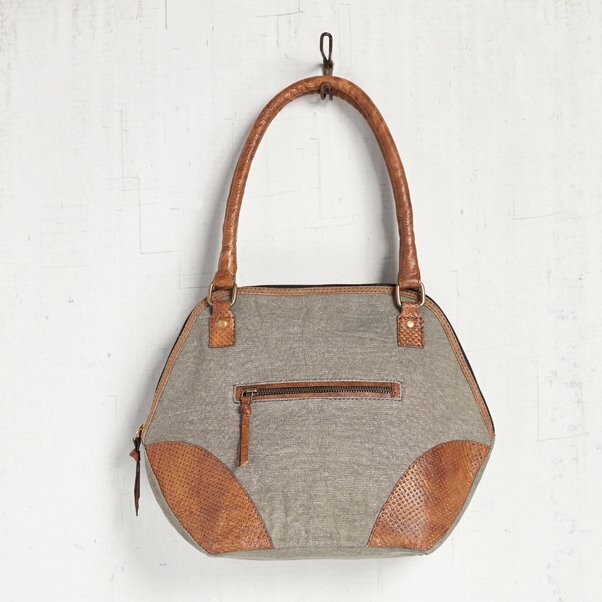 Pierced brown leather in a mesh pattern accents the bag on the front and where the handles attach. Two brown leather handles with 7.25" drop, for comfortable carrying from the shoulder. The roomy interior is lined with the signature Mona B. cotton lining, and has one zip pocket and one open pocket. Measures 14"W x 10"H x 4"D. Made from up-cycled canvas from military tarps and tents. The fabric shows the history of its travels which may include stitch marks, minor staining and unique scars and bruises. Color variations and patches add to the uniqueness of each bag. Heavy cotton canvas.